Running to Stand Still: New Kicks ! Speedy run in the new shoes. I have been a big fan of the 2200 series. I like them in black. 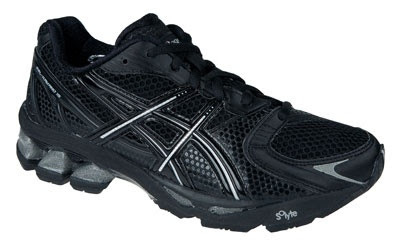 I had a pair of black asics basketball shoes that I loved. Nice! I've run in Asics for years, but recently have had issues getting them in my size (I refuse to drop a non-refundable deposit on a shoe I may try on and not end up buying). I love the first run in new shoes! Man I'm glad you posted this. I tried on the 15's the other day. How do they feel? Are they stiff? I don't like the colors of the normal 15's, Black - now those are sweet.. I desperately need a new pair of shoes before my half in 2 weeks. It's either the 15's or another pair of the Gel Nimbus 10's. Ah new shoes. I have to buy a pair for myself soon. Woah, what awesomely cool kicks those are!!! And just think, since they are black they will go with whatever outfit you put on!!! Ok, not like you wear outfits but well you know!!! Good luck running in them!! !